In advance of our new ebook, and some other projects just behind it, I built a new website focused on High-Resolution PPC. To support that site, I created a new AdWords account and added two small ad groups with a total of 9 keywords and two text ads. Every keyword is a brand or navigational variation of the term ‘high-resolution ppc’. That phrase is in the domain name and all over the home page, which serves as landing page for both ads. This is a story of how quality score evolves. At First, They Don’t Trust You This is a brand new account. It has no CTR history. The ads are new. There is no visible URL history. The website has existed, and been indexed in Google, for a few months but with just a few pages and virtually no traffic. The keyword ‘high resolution ppc’ does have a CTR history, because in our Clickequations.com AdWords account we buy the broad match version and aim ads at a page for ebook sign-ups. I added six exact match keywords (shown right) to the first ad group. The initial bid was set to $0.10. A few minutes after creation, they were all listed with a quality score of 3/10 and a First page bid estimate of $1.00. Interestingly, Relevance was initially listed as ‘No Problem’ but 14 hours later is listed as ‘Poor’ for every keyword. Because the corporate account had bid on the keyword, I looked in ClickEquations to see how it was doing. 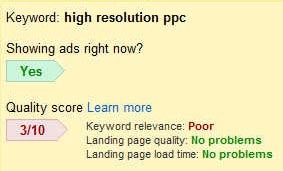 ‘High resolution ppc’ (broad match) has a quality score of 7 and a Max CPC of $0.10. Relevance says ‘no problems’. The ad copy and landing page for that keyword also use the phrase in just about every place possible. 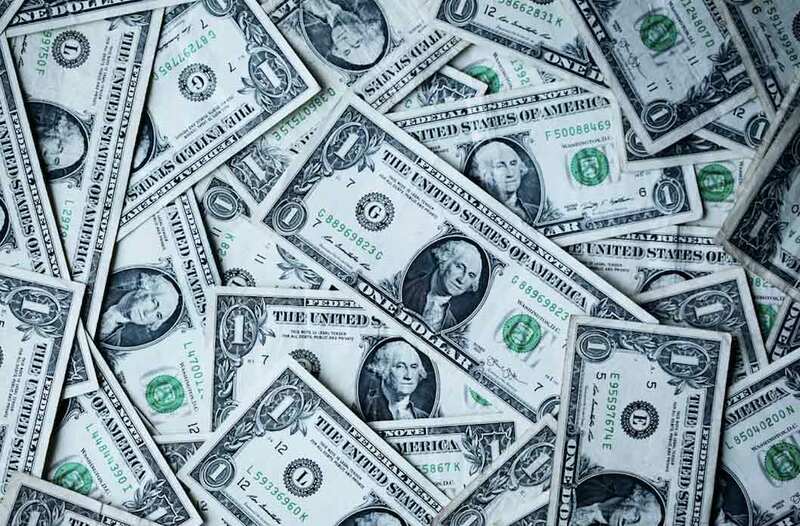 Given the lack of history, and knowing that history matters, I accept for the moment the fact that it’s necessary to bid $1.00 per click for a phrase I made up (ie the competition is light, on both content and competitive bidders). So I raise the bid on the one exact match keyword ‘high resolution ppc’ to $1.00. The ad did not start showing in the SERPS. So I went to sleep. Money Talks This morning I checked again. The ad from the new account is now in position #1, at the top. It still has a quality score of 3, and a ‘Poor’ rating for Relevence. Someone explain how these keywords could be more relevant for the search queries, text-ad copy, and target URL – all of which contain the exact 3-word phrase. It had zero impressions or clicks overnight. To boost my CTR, I clicked it the time I ran my search to check it. Cost me a buck, but my CTR is now 100%! There were only 3 ads shown the first time I searched. The book ad, the one from ClickEquations, and one from AdWords themselves trying to lure innocents into PPC for the first time. Interestingly, and perhaps coincidentally, after my $1.00 self-help click, the phrase now returns 14 AdWords ads – due to broad matching on the ‘ppc’ part of the search query no doubt. I guess once Google sees that people who search this phrase will click paid ads, the ads come a-runnin’. What Happens Next There’s nothing too revealing in all this. The time frames and data sets are tiny, the behaviour is more or less consistent with what we’ve been told about quality score. Yet I find the rare opportunity to view a case study with so few complications appealing. It won’t be pure, of course. Some of you will go run the query, depressing the CTR. A few will even click the ad, wasting a little money 🙂 But over the next few weeks we’ll see what happens. How long will it take to get the quality score up from 3 to at least 7? When will Google recognize that the relevance is perfect, not poor? Will the CTR on the new version of the ads beat the old ones that earned the quality score of 7? How long until I can get the bid down from $1.00 (which clicks are not worth) to $0.10 (which they may be)? Once the account grows, what will be the best way to monitor and control lifetime account CTR history, and visible URL CTR history?